It was 4 a.m. on April 1, 2015. The hospital room was filled with family and friends holding hands and bowing in prayer. Two brothers donned in hospital gowns leaned in to give each other cheek to cheek Muslim greetings of peace before going under the knife for what they hoped to be a life-saving operation. As the families of both men anxiously awaited the outcome, one of the doctors entered the room. Something happened that he had never seen before, he said. The family braced themselves for what seemed like bad news. He reported that as soon as he attached the kidney inside the Muslim who needed the kidney, he started passing urine right away. This was a miracle, the doctor said. Any foreign object that enters the body, the entire body comes together to fight that foreign object, the physician explained. “Yet, a so-called brown man, a Latino, Mexican and Puerto Rican put his kidney into a Black man, a so-called African American and it took right away and started passing urine; so, it belonged there. All Praise is due to Allah,” said Brother Rafael X, “My Brother and I are one. 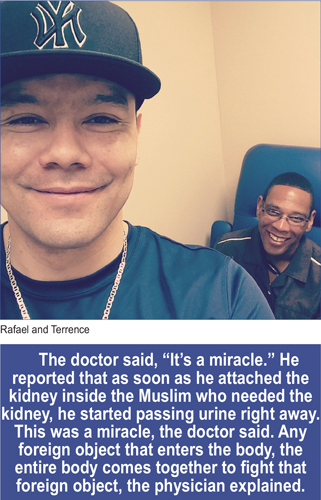 Born and raised in San Antonio, Texas, Rafael X, a Latino Muslim who turns 42 this year, decided to go against the advice of his family and even his doctors to give his fellow F.O.I., Terrence 3X, a Black man, one of his kidneys. Bro. Rafael said if he passed all the medical requirements needed to be a kidney donor, he was all in. “We say … if I have a bowl of bean soup and this brother doesn’t have none, he has half and I have half. Now, giving soup is not much of a sacrifice. We can do that. We can give a t-shirt or a pair of shoes, but to give a body part? Now, that’s where the Scripture becomes real because ‘there is no greater love than to lay down one’s life for his friend’, (John 15:13),” said Bro. Rafael. Brother Terrence 3X, the 45-year-old husband of Sister Tina and father of four, moved his family from Detroit to San Antonio, Texas, in 2011 because his job relocated. He was an 18-wheel truck driver for the Department of Transportation. The department requires employees take a medical exam every two years, he noted. Unfortunately, when he returned in 2014 to get re-examined, he noticed his card was only approved for one year. He thought there was some type of mistake made, but was told to see a specialist because his tests showed he had excessive blood in his urine. He found out that not only did he have blood in his urine unseen to the naked eye, but he had too much protein in his urine as well. “My kidney function dropped to six percent, but by the grace and mercy of an angel called Rafael X, who I had known for a little under two years, I didn’t have to get the worse type of dialysis,” Bro Terrence praised. The process Bro. Terrence had to go through was called peritoneal dialysis, which included placing a port in his stomach, mid-cavity. The dialysis machine then pumps fluids, basically sugar water, into him. It sits for two hours and then the machine pulls it out along with the toxins on his kidneys, his spleen, and all his mid organs because his kidneys were not able to pull the toxins out of his body, which is what urine does. He Endured this every day for eight hours. 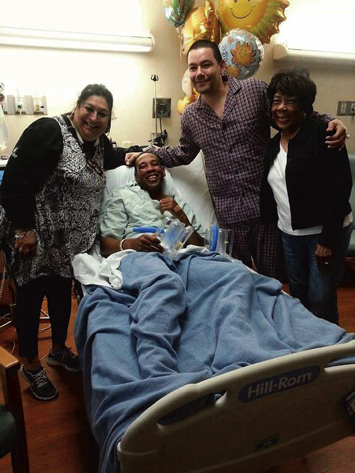 Brother Terrence in bed and Brother Rafael and their mothers. 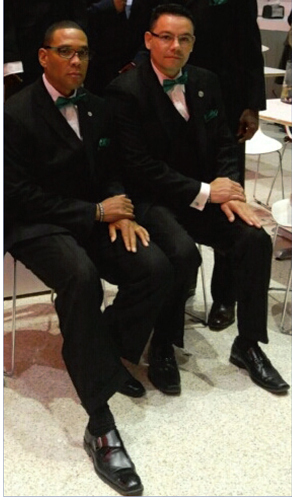 “I was the student captain over San Antonio’s Study Group at the time,” said Bro. Terrence. “So I had to let the F.O.I. and the M.G.T. know, the believing community that I wouldn’t be out as much as I wanted to be because I had to be on the dialysis machine. Unbeknownst to me, another F.O.I. from San Antonio, Brother Bernell, called my wife and asked what he would have to do to get tested and what did he have to do to donate his kidney,” Bro. Terrence recalled. “No one knew he had inquired and my wife didn’t even tell me at the time until he was denied because of his blood type.” However, Bro. Rafael befuddled by what he perceived to be disappearing acts by Bro. Terrence finally asked someone where is he always running off to? One of the brothers explained that Bro. Terrence was on dialysis. Bro. Rafael began a series of extensive tests, including a blood test to see if they were a match. He said following the Honorable Elijah Muhammad’s “How to Eat to Live” prepared him for a trying moment. “I was eating properly, fasting three days every month, exercising, doing my prayers, reading, studying, and living to the best of my ability. Bro. Rafael said his doctors tried to talk him out of it. “We’re concerned for your safety,” said the doctors. The doctors were in awe of Bro. Rafael’s test results. They said the average person with two fully functioning kidneys is at a 60 and that Bro. Rafael was at a 130, which meant they could take half of that and with one kidney, he still be above an average healthy person. Also, he had to get a chest X-ray done and the X-ray technician told Bro. Rafael he had never seen lungs as large as his and that he couldn’t capture it all in one frame. “The tear jerker was when the nurse was reading off the blood types and the final preparation for the transplant,” said Bro. Terrence. For Bro. Rafael to qualify as a donor, their blood types had to match. After finding out what Bro. Terrence’s blood type was, Bro. Rafael’s mother didn’t think her son would be able to help because they were not a match. She had birth documents that displayed her son’s blood type. Miraculously though, the blood test results came back that they were a match. “Allah-U-Akbar! (God is the greatest! ),” Bro. Terrence declared. “Bro. Rafael’s mother burst out crying when the nurse was reading the blood type because Bro. Rafael was supposed to have a twin brother, but his brother didn’t make it and it was like he took on all of the attributes of his brother,” said Bro. Terrence. Bro. Rafael was going through a divorce when he decided to donate his kidney. “In the Holy Qur’an, it says if you give, Allah will bless you ten-fold,” he declared. “After this ordeal, I met a beautiful MGT, Sister Lareesha X and got remarried in 2016. I always wanted 10 children. Here I was a 40-year-old man without any children, but Allah gave me 5 babies because me and my wife had twins and she already had three children. So here, I give one kidney and with 5 children I have 10 kidneys. So, Allah is real, Allah is God, and He does not hold back on his word,” Bro. Rafael said. He said his mother was the only one that supported him from day one. 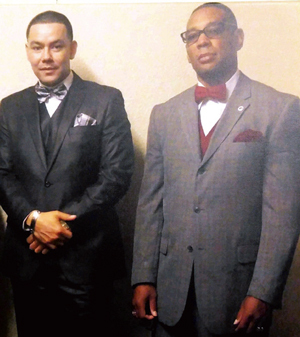 “My father asked, ‘now what if I needed a kidney.’ And other people asked it to, but I said to myself, ‘now this brother loves the Honorable Minister Louis Farrakhan, you don’t. This brother is out saving our people and you’re not. This brother is striving to live a healthy life, you smoke cigarettes, so damn right, I am giving him the kidney,’” Bro. Rafael said. The surgery was a success and the recovery was smooth with no complications. The doctors told both men they had never seen the insides of anyone look so clean. Bro. Terrence and Bro. Rafael expressed how grateful they are for the support of their Student Coordinator over the San Antonio study group, Cedric Muhammad, and all the Believers, friends, and family from all over the region as well as their well-wishers for their donations made to GoFundMe and mostly all the prayers for their continued success. They just had their two-year checkup and both are eating well and staying healthy.